In my frenzy to make dinner tonight and in the mood for something Asian, I grabbed a head of romaine lettuce from the refrigerator. Hmmm… Vietnamese Summer Rolls? …much too much work for tonight. Then in a moment of slight genius I thought, “Why not combine the flavors of Vietnamese Summer Rolls with the ease of a salad?” The dish turned out better than I expected, but when all was said and done it reminded more of Sesame Noodles than Summer Rolls. 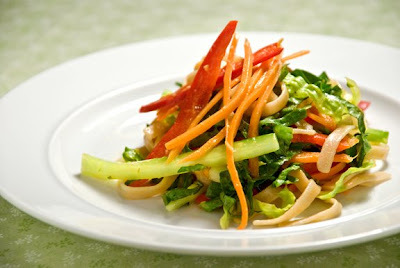 Although, unlike traditional Sesame Noodles, this version is much better for your waistline because I bulked up on the veggies and reduced the quantity of the high calorie ingredients in the dressing. I imagine if I were to add more peanut butter and a little raw sugar to the dressing it would have turned out even more delicious but then I’d have to wear the burden of additional calories – the choice is yours. For me it comes down to my motto: “Eat like a rabbit and live like a couch potato.” Perhaps that’s a bit of an exaggeration, but the truth is that sitting at a desk all day at work and reading books and blogs in my spare time doesn’t burn very many calories. I choose to eat delicious food that’s low in calories and avoid wasting my precious time at the gym. Cook noodles according to the package directions. In a large bowl whisk together all the dressing ingredients until smooth. Add the hot noodles and coat thoroughly. Add the remaining ingredients and toss until well combined. Serve a room temperature or chilled. Looks so yummy!!! I think I may opt for the more peanut butter haha!